When it comes to buying a cold laser for the home, many people are overwhelmed with the conflicting claims, specifications and hyper-marketing literature. It is our job at ColdLasers.Org to help you understand all your options and we know that none of the lasers on the market have any exceptional technology. They all work on solid technology (controlling the dosage in photobiomodulation), not based on hype or cosmic psuedoscience, and photobiomodulation provides solid results so there is no need to fabricate extraodinary claims. Since we sell more different brands than anyone, we can help you understand the strength and weakness of every cold laser option. If you need help, call us at 1-800-388-0850 and we will do our best to guide you. This article is about home cold lasers and not about lasers for doctors' offices, veterinary and companion pet lasers or equine cold lasers. These are the main 3 benefits of a cold laser. Considering that 28% of Americans are in pain at any one time, it is no surprise that there is a wide range of cold lasers available for home and office use. We can NOT sell you a class 3b or 4 laser for off-label uses (other than the 3 reasons listed above). No one regulates the use of laser after they are sold so owners can experiment with other applications at their own risk. You can buy a non-FDA cleared if you are treating animals, but non-FDA cleared systems often have less control. If a company can't get FDA clearance, it might an indication of underlying quality, efficacy or specs issues. When it comes to choosing a cold laser for home use, there are several different factors that will have a big impact on your decision. Are you treating a human or an animal? If you are only treating animals, you don't have to buy an FDA cleared laser (like the Laserex, RG500 or VL500) but you need to really understand the specifications of the device to make sure you are getting something that will work as well as an FDA cleared device and you are not just buying an expensive laser pointer. We test all the lasers we sell so they are all the highest quality. What is your budget? When it comes to cold lasers, you get what you pay for. More expensive units have more flexibility, higher power levels and typically shorter therapy times. If you have an acute (recent) injury, the treatment time is not a big issue but people with chronic injuries or problems that require treating a large surface area can accumulate a lot of treatment time. If you are doing your cold laser therapy every night while you watch your favorite TV shows, then the treatment time is not that important, and you can buy a less expensive device. Based on an average cost of $50/ cold laser treatments, many home users get a return on their investment of less than 1 year. 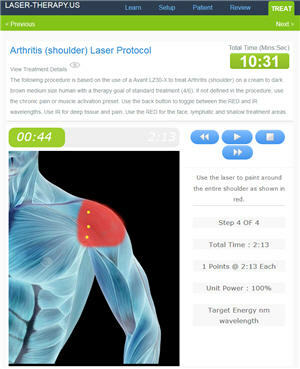 Have you tried cold laser therapy and achieved successful results? If not, you may want to try it before you buy and confirm that it does help with your specific issue. When you try it, make sure you write down the manufacturer of the equipment (and the total dosage of the therapy session if possible) so we can help you find the same or a similar model to the one that proved itself. Try a class 4 system if possible to make sure that you are not being treated with a super low power system (less than 100mW) like an Erchonia or Microlight that might take months worth of treatments to see results. How important is safety. Lasers come in classes from 1 to 4. The class is based on the ability of the device to do eye damage. Class 4 lasers can do immediate damage to the eye if used improperly and in rare cases, they can heat up tissue if misused. Class I cold lasers are the safest. Keep in mind that class 1m lasers are much more powerful than a class 1 or 2 systems. "M" class lasers can be up to 500mW of equivalent power (the same as class 3b) but they cannot do eye damage unless the energy is focused thought optics. 1. Do you have a preference about the wavelength of the device? 80% of cold lasers operate in the 800nm to 860nm wavelength for therapeutic treatments. There is some research that indicates 810nm is most effective for rebuilding tissue so the Chattanooga, Avant, PowerMedic, 3b Scientific or EVOlaser 810nm systems are great options. There are several manufacturers (Like Erchonia and Aura) that claim the best results are in the 600 to 680nm wavelength range. There are several top brands (TerraQuant, Thor, K-laser and Avant) that operate in multiple wavelengths. Avant is the best dual-wavelength class 3b system. 2. Do you want pulsed, continuous or both types of waves? 80% of the manufacturers offer pulsed waves and these manufacturers typically advice people to use pulsing for better long-term healing. Pulsing the lasers can allow for higher peak power levels while still being safe. On the other side, continuous wave lasers allow for higher dosages in the same treatment time and they allow for saturation of a damaged area with photons. Apollo lasers are continuous wave only. Terraquant systems and PowerMedic are pulsing only. All the other systems on this site offer both. Higher dosage power levels can be good because people feel faster pain relief. For home use where the user typically wants healing, it is less of an issue. If possible, it is best to buy a laser that does both pulsing and continuous. 3. How much power do you need? One of the biggest debates in the industry is about the power requirements and there is no one right answer. In general, more power = shorter treatment times or higher dosages in the same treatment time. If the power is too low, the treatment might not ever get enough energy into the tissue to have a big impact. Longer, lower power-level treatments can often get the job done for minor problems. The exception is super low power-level devices (less than 100mW) like you find on Ebay and Amazon. A class 4 system will deliver 100 to 1000 times more power. Higher power equipment gives users the chance to excite more cells in the target area where a lower power device will excite a smaller percentage of the cells. The following table shows our recommendations for home use cold lasers. High peak power super-pulsing 3-wavelength emitter with one of the largest treatment areas available. Battery operated handheld. One of the most popular cold lasers in the world because it is extremely safe but still offers high peak power outputs and 3 wavelengths at a very low cost. Battery operated handheld. Dual wavelengths, Continuous, pulsing and sweeping modes. Hand free operation. Can also be used for laser acupuncture. This laser does everything well. Battery operated handheld. Pro and Consumer. The most flexible laser on the market. Battery operated handheld. Pro and Consumer. With 1000mW at 637nm, it is the most powerful red therapy laser on the market. 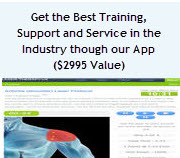 PowerMedic Pro 1500 Class 3b A recommendation consultation and long term doctor's assistance is included in price $4995 Battery operated handheld. 3 watt high 50% duty cycle pulsing laser is very safe but can delivery higher dosages. 3b Scientific Laser Shower PowerTwin 21+ Class 3b A recommendation consultation is included in price $4795 or $5900 This system offers the largest treatment area of any handheld laser. With pulsing and continuous, this system offers a great balance of safety and higher dosages. EVOlaser Class 4 A recommendation consultation is included in price. Setup and certification level training included. $9950 and Up The new champion of affordable class 4 systems. Pilot Laser 9 Class 4 A recommendation consultation is included in priceSetup and certification level training included. $7995 Lots of power for the money. Pulsing and continuous wave 9 watts @ 810nm but it has some drawbacks. Please call for more info. Class 1m lasers can be up to 500mW equivalent power but can NOT do eye damage so they are the safest option for home use. *Please contact us for special pricing. We will beat anyone's price on any laser. There are many other applications for the device that cannot be listed here. To check and see if there have been successful research studies done on a specific condition click here and enter the condition. Irradiation of the Eyes At very close range, Class 3b and 4 lasers are potentially harmful to the retina. Although accidental retinal damage is highly unlikely, it is recommended that laser protective eye wear be worn. Carcinoma Do not use the laser over any known primary or secondary lesions. Thyroid Laser should not be used over the thyroid gland. Tattoos and Other Pigmented Tissues Dark pigments, such as tattoos and melanin, may absorb light at the wavelengths used in laser therapy. With class 3 or 4 lasers, the absorption of laser energy by these pigments may cause localized heating of the tissue. It is recommended that you test darker-pigmented tissue. Pregnancy Cold laser therapy is a typically not recommended for use over the pregnant uterus, but this is mainly because there is not enough evidence to conclude, and it is better to avoid any risk or liability. Pins, Metal Plates and Plastics are NOT Contraindicated: Laser may be safely used over stitches, as well as metal implants, pins, plates and plastics. Selecting the best cold laser for home use is not as hard as it seems. If you have the budget, the Avant LZ30 is a great class 3b and the EVOlaser 810 9-watt is a great class 4 system. They are both amazing products. If safety is the highest priority or you want something over-the-counter, the family of TerraQuant products offer great performance for less money. Try to stay away from products based on pseudo-science and magic (quantum waves, soliton wave, zero point energy, scalar waves) and check the laser specifications to avoid buying something that is actually LED or too low power to have much impact. Just avoid the fringe manufacturers and stick to products based on photobiomodulation and you will get the same results at home that you get in the doctor's office.